QUESTION: I have been a diabetic (type two) for 15 years and had no problem with it causing me any problem. Well, a month ago I started to get high sugar levels of around 10mmmol to 15 mmol, i increased my tablets but was still high in the mornings so i changed my breakfast from Weetabix to a boiled egg and brown bread. Since changing by breakfast i can go to bed with a 6mmol level and wake with a level of 5mmol, after a hour and a half after breakfast it is back to 5mmol, very much the same after anything i eat now, ice cream or any high sugar food makes much difference to my blood sugar levels now,going, one morning it was 7mmol and after a day witout food it only went down to 4.5 mmol. 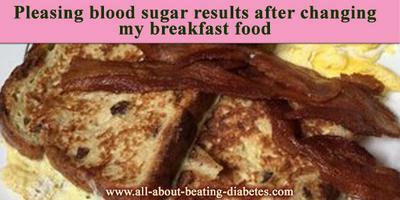 So why would changing my breakfast give me the results i am getting and i am very pleased with? It is very good that you are trying to establish a connection between the breakfast and your blood glucose concentration in the morning, but you have to keep in mind that the pills are playing a role in this situation too. So, at first remember that when you are eating something, your blood glucose rises because the glucose from the food gets absorbed in the blood stream. This elevation in the blood glucose concentration stimulates the insulin production. As you probably know, insulin reduces your blood glucose concentration, because it puts the glucose inside the cells. You can see by yourself that the glucose metabolism after breakfast describes a curve of blood glucose spike (the absorption of the glucose) and blood glucose reduction, caused by the insulin production. The reduction in the blood glucose concentration depends on the insulin production - higher insulin production leads to lower blood glucose concentration. This is important, because with the elevated drug dose, like you said, the production of insulin is stimulated. So, when you are eating something high-in-carb (although in limited amounts), your blood glucose will get back to normal level because of the drugs you are taking. Because of this, I have to tell you that the breakfast change is not the only factor, which leads to such good results. The elevation of the drug dose is the major factor for the better blood glucose results, which you get. Keep up with the good work and keep your blood glucose within the reference ranges. Could Simcor raise my blood sugar level?